Perfect for two families!!! Two master suites with king-size beds and private baths! Four bathrooms! A total of five bedrooms and four bathrooms! Screen-enclosed pool and spa! Free high speed internet! Wi-Fi! Our five-bedroom/four-bathroom house is only three miles from Walt Disney World, located in the Indian Ridge Oaks community of Kissimmee. Features include two master suites with king-size beds, all towels and linens, a fully-equipped kitchen, five cable TVs (including new 40 and 50 inch LED television), DVD players, and a 30-foot, screen-enclosed, swimming pool (with gas pool heat available in winter). A whirlpool spa connects to the pool, and doubles as a kiddie pool. 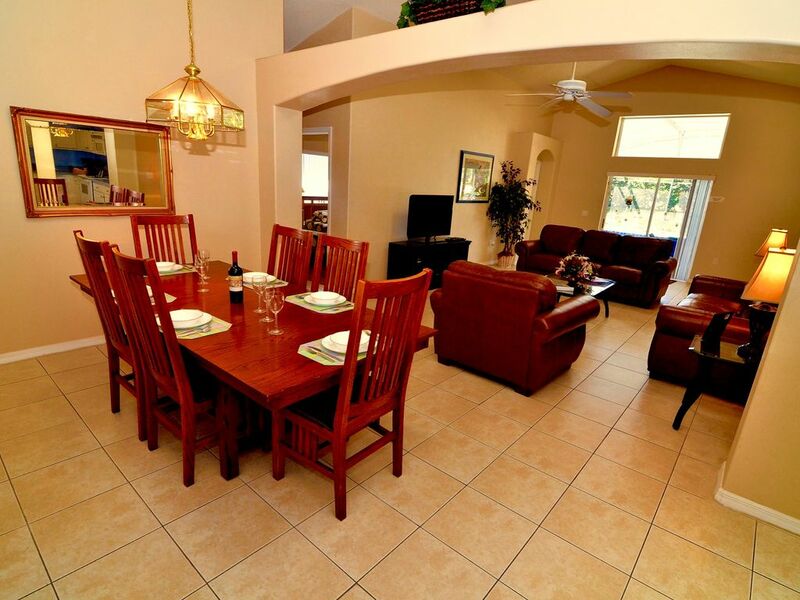 The perfect size and perfect location to make your visit to Central Florida the perfect vacation! Keywords: Close to Disney! Perfect for two families! Why not? Why get one room at a hotel that charges way too much for just ONE room? HOTELS ARE OVERPRICED, DIRTY, AND SMALL!! When our family traveled to Florida when the kids were younger, we loved everything about the entire vacation, except for one thing: the 'nearby' hotel rooms were OVERPRICED, DIRTY, AND TINY!! This is truly what we have called 'our home away from home' and we only hope you can consider calling this amazing, spacious, and beautiful property as 'your own home away from home' - but just until your vacation is over! All 5 Bedrooms are one the main, and only, level 4 Full Bathrooms (2 Master Bedrooms have their own private bathroom) Private Pool Gas Grill use INCLUDED in pricing! (I'm surprised to find additional charges elsewhere) Rec Room with pool/ping pong table and foosball table!! 4 full bathrooms. Main master has separate shower and tub. wireless internet for no additional charge. Two tables in house; seating for 10. Additional outdoor chairs and table for dining on pool deck. (5) 26' Widescreen LCD in Main Master; 5 TV's total. Spa is part of pool system. We were very pleased with this home. It was large enough for our complete group. When we had questions we would receive most responses in a timely manner. We have been renting homes in the Disney area every year for 8 years and this is the first time that I would absolutely not return to a house. It is in desperate need of cleaning and updating. There was so much dust on the ceiling fans and fake plants that it was gross. There were piles of dust and dirt accumulated in the corners and dead bugs on the floor proving that the house is not cleaned well at all. The burner pans on the stove were crusty and rusted - one burner actually caught fire while we were cooking! When we arrived, all of the towels in all of the bathrooms were damp and had to be washed before they could be used. The pictures have to be years old. The bed linens shown are definitely not the same ones in place now - all of them were worn and threadbare. Beds were not really all that comfortable but manageable. The outdoor furniture smelled of mildew and the pool deck needs to be pressure washed desperately. Everything needs a good cleaning and a fresh coat of paint. But the house was spacious and the location was great. If the management would put just a little effort in to clean and update, it would be a slam dunk rental but in its current state, there are hundreds of better options in this area. . Dirty, moldy, and unresponsive management. First when we arrived we found a dead frog in the bedroom. Then we started seeing ants crawling up the walls of all rooms, in the beds, in the kitchen, on the floor, everywhere. Then the showers were dirty and moldy. The master shower had black mold growing in the clear shower knob. The other bathrooms had calcified rust in the tubs. We were cleaning out trash in closets and drawers from previous guests. We had to purchase bug spray just to make the place habitable. The beds were old and lumpy making sleep very uncomfortable. When I called the management company 3 times over 3 days they neglected to answer and only tried calling back once. Unfortunately the owners were out of town so I did not have any other way to get in contact with someone that could help. 0/10 would not recommend, even though the location was within decent proximity to Disney. the house shows signs of heavy wear. But it served our purpose and made our stay near the Theme Parks enjoyable and convenient. The pool was enjoyable. A few inconveniences; 1. Repair man was doing some work early one morning outside, banging and drilling. Woke everyone up. 2. Duke Energy replaced a transformer across the street and the power was off for 6 hours plus on the hottest day we were there. (unavoidable) 3. Small ants everywhere in the house and by pool, not uncommon for Florida but irritating. I would recommend this home.